After we purchased our land near Concho, AZ, I knew we were going to need some big-time help making it enjoyable for use. I called Jason and he spent several hours walking our land, 121 acres, with me. We needed to have private roads cut in very rocky and rugged terrain along with a 30,000 sq ft building pad. Jason also took care to advise on the best possible locations for our septic system, water holding tanks and other excavation work to help minimize the overall expense to us. Jason took control and made the project stress free for us. He not only went above and beyond what we expected, he completely explained and handled the permit process and inspection process. Jason installed our septic system, water tank and irrigation. He coordinated and took delivery of all the equipment and supplies needed to complete our improvements. Pindale Domestic Water Improvement District. 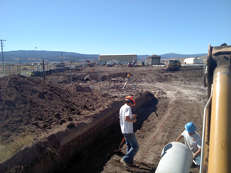 To whom it may concern: Desert Rat Excavation, Inc. has done numerous work for the Pinedale Water Improvement Distict. We have used this company for at least 5 years or more. They have been reliable and we have also found their work to be done with the quality and expertise that we require in our water system. They have done new installations and numerous repairs to the Pinedale Water system. This includes repairs and replacement of service lines, water mains, and also new taps as well. I can honestly say that when we need things done "nou/", they are there right away. It is nice to knowthat the jobs are always done in a quality manner. I would recommend this company to anyone who requires experience, quality, and service. If you have any questions, feel free to call. testimony to his professionalism and dedication to customer service. Tenacious, honest, straightforward, sincere, and courteous, Jason Craven is a professional whom I would aggressively seek to resolve even the most complex of construction issues. My observations of Jason have revealed nothing short of a kind, sincere, and courteous individual who is genuinely interested in the success of others. His attitude toward customer service modifies my somewhat cynical approach to construction from; “Good, Fast, Inexpensive – pick any two” to “Good, Fast, Inexpensive – available from Jason and Desert Rat Excavating”. Just call “The Rat!”. When our clients need help on excavation or demolition projects, they know they can rely on Desert Rat Excavating, Inc. to get the job done on time and done right the first time.